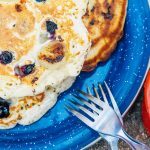 Combining two classic pancake recipes into one, these blueberry banana pancakes are a warm and fluffy way to start your morning. For whatever reason, making pancakes – as simple as they seem – has always intimidated us. On the handful of rainy mornings we’d get back in Los Angeles, Michael would attempt to make banana pancakes, but the results were often varied. Sometimes the cakes were flat and dense, sometimes they were overcooked, and sometimes the outside would be perfectly golden brown but the insides were completely uncooked. Megan, on the other hand, has a perfect record of setting off the fire alarm every time she attempts a pancake recipe. So we after a while we just gave up on them and reconciled ourselves that maybe we were just “hash brown people”. However, this year we felt we needed to give it another go. 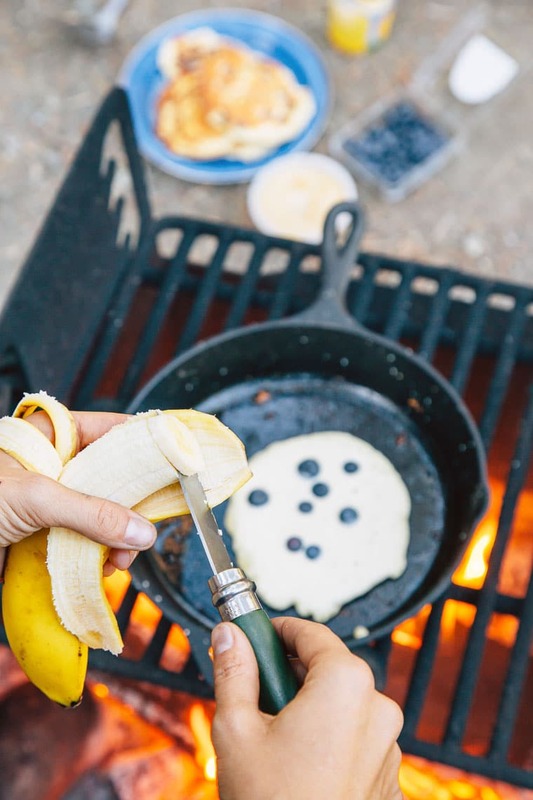 There’s no denying that pancakes are a classic camping breakfast, and we were seeing pictures of people making them all over Instagram. Surely, it couldn’t be that hard? 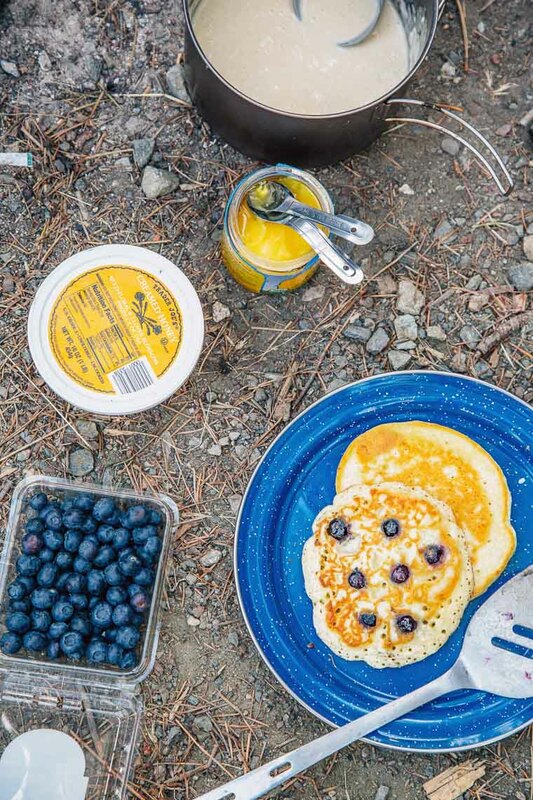 We decided to swap out some of the more temperamental ingredients – like the fresh milk and butter – with more rugged options that could survive for awhile in our camp pantry. We used Milkman powdered milk, which, as far as powdered milks good – tastes pretty incredible. The other secret ingredient we discovered was ghee or clarified butter. 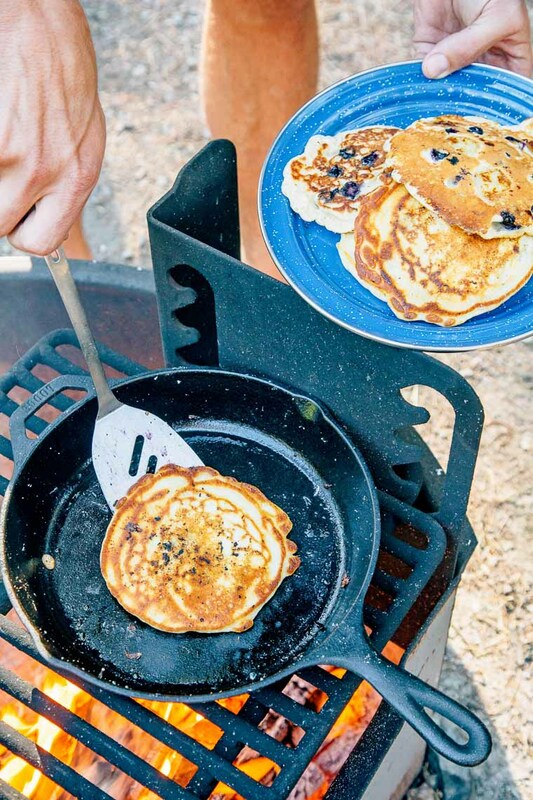 When cooking pancakes over a campfire or even a camp stove you’ll want to re-butter the pan for every pancake you make. 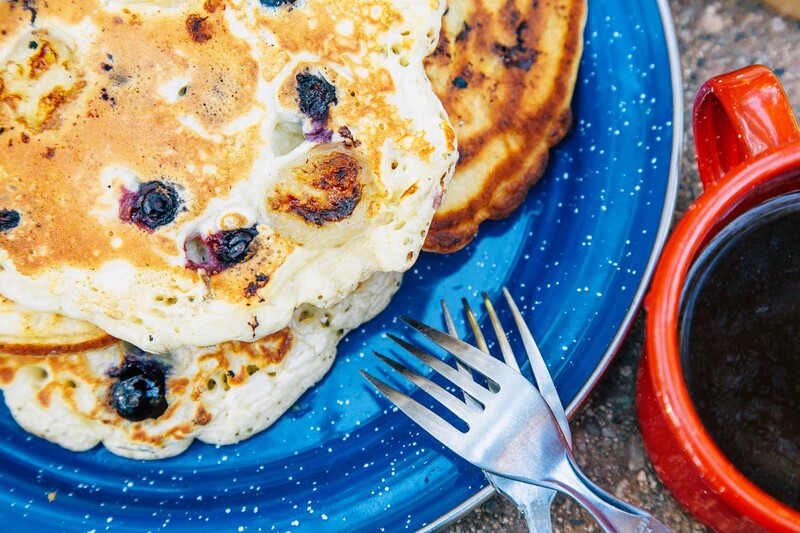 (If you’re being butter conscious, then maybe once every two pancakes.) Ghee has a lot of advantages over traditional butter, but the main ones are: shelf stable and higher smoke point. Shelf stable means that we can carry it with us without having to carry a cooler. And the higher smoke point means that we don’t run the risk of burning the butter. For this recipe, we opted to try a bit of a hybrid. 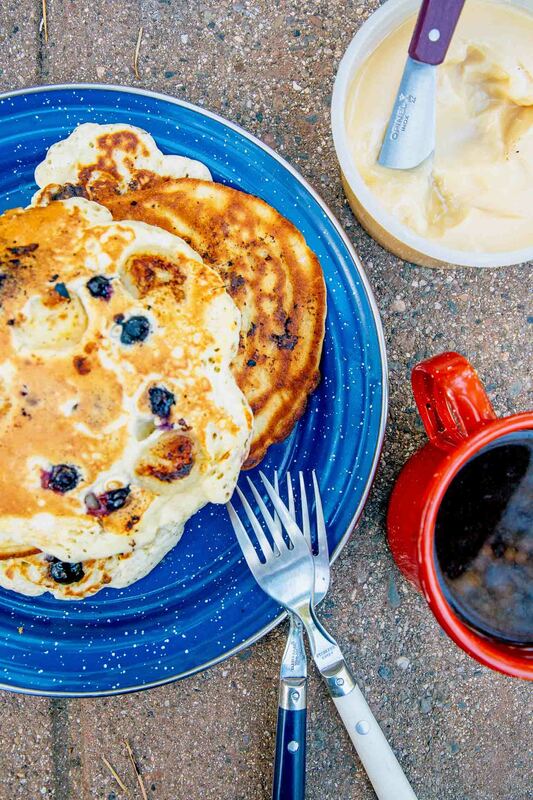 Blueberry pancakes are a thing, and so are banana pancakes, but we found that by combining them together we got more than the sum of their parts. 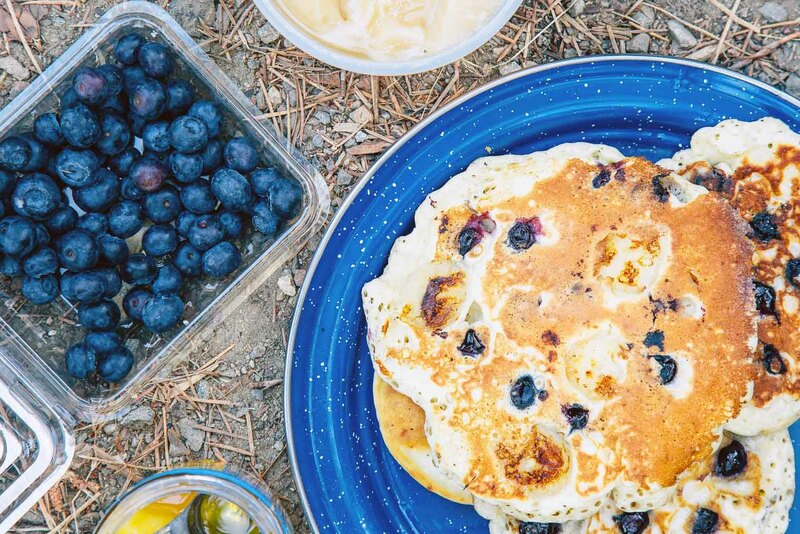 The smooth and chewy consistency of the banana really complements the flavor of the ghee, while the blueberries provided a fresh and juicy pop that played nicely against the maple syrup. We’re not sure why we haven’t been doing this the whole time. So if you’re looking for pancake recipe that you can take with you on the road, then this one definitely a great place to start. 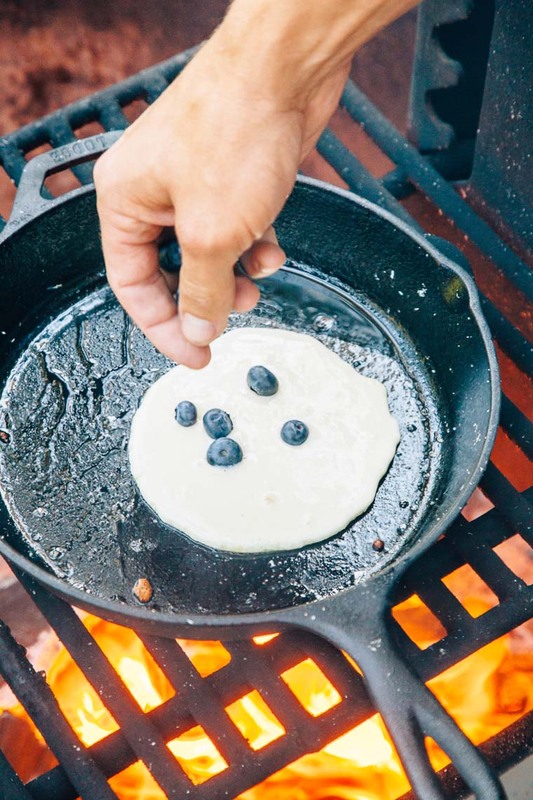 Heat a skillet over your campfire or camp stove over medium low heat. Add a teaspoon of ghee to the skillet and swirl to coat the pan. 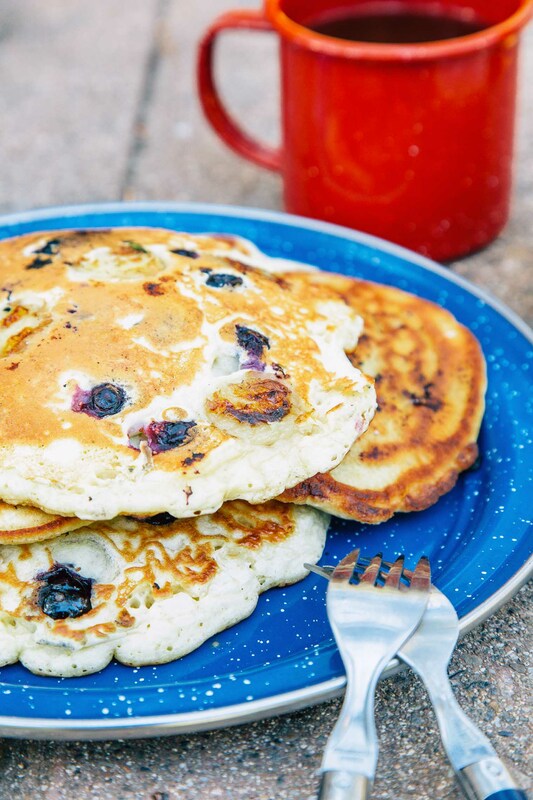 Pour ⅓ cup of the pancake batter into the center of the skillet and scatter some of the banana slices and blueberries on top. and cook for a few minutes until the top begins to bubble and the sides are set (about 2-3 minutes). Using a spatula, flip the pancake and cook the other side until golden. To serve, stack the pancakes and top with maple syrup, jam, butter, or honey. Enjoy! Never thought of powdered milk, great recipie, thanks for sharing! Is this batter thin enough to put into a squeeze bottle? For easy distribution into the hot pan? Interesting. I suppose it depends on how big the hole on the squeeze bottle is? The batter isn’t particularly thick, so it might work. Definitely sounds like an efficient way to cook pancakes. We’ll have to try it out. Hello! I was just wondering if you keep your maple syrup in the cooler. Is it real maple syrup or maple flavored? Michael is from New England. It’s real maple syrup or nothing! ha. We don’t keep it in a cooler. this is such a nice information and i really lovee Banana pancake…..